Well, I for one am going to state for the record that Nov. 4 is a perfectly appropriate time for me to share Halloween pictures with you guys. While everyone else has already moved onto posts about their Thanksgiving table settings and the mums on their front porches, I'm bringing you pictures of my kids in their costumes. This is what we do when we were without Internet for three days (SEEMED LIKE A MONTH) but we are not willing to let your eyeballs get away without seeing our children dressed up as a ragtag gang of unrelated characters. We had a zombie (you can imagine how proud I was of Nick's particular pick), a Woody from Toy Story, and a Harry Potter. Nathaniel had Quiddich goggles, but he refused to wear them because I didn't get him Quiddich ROBES. I got him a REGULAR robe. 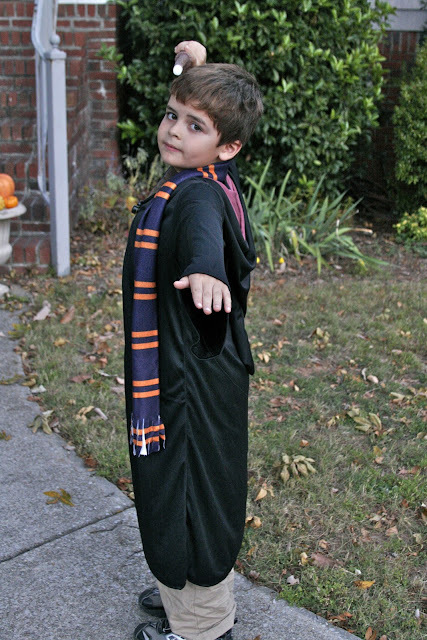 I suppose I should consider myself fortunate that he agreed to wear the scarf and carry the wand. 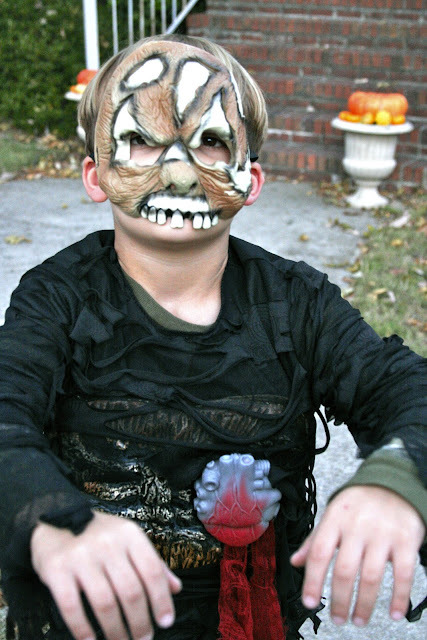 ... although his disembodied heart didn't even make it out of our driveway, and his mask "got snot in it" after we hit the second house -- so he wouldn't wear it anymore. 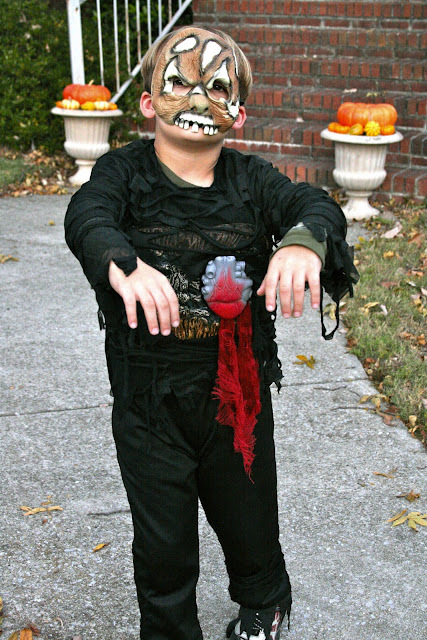 I would love to know if anyone in the history of history has ever bought a costume with a mask that their child wore THE ENTIRE NIGHT. Because whether it's a zombie or Darth Vader or Cade Bane or a storm trooper, we've never had a mask make it longer than 20 minutes. 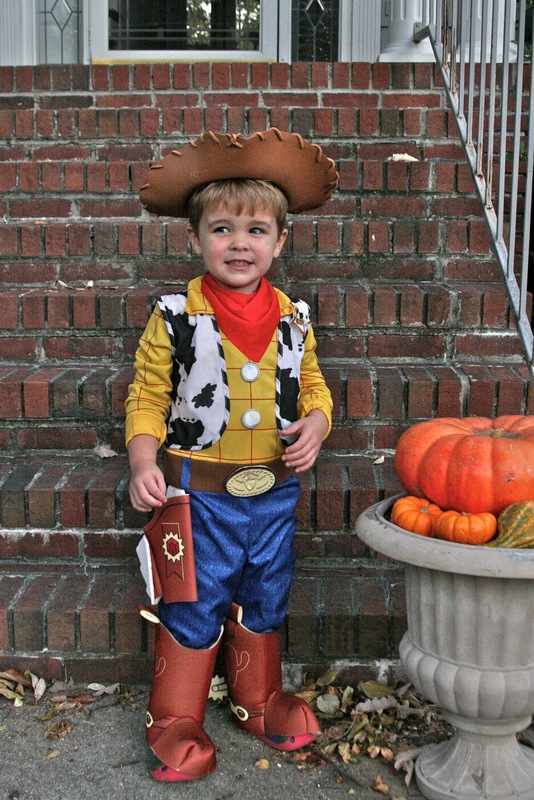 Jake sure did make an adorable Woody, though! He has a huge head like Nathaniel's, so that hat wasn't long for that head, either. Might as well have been a MASK. 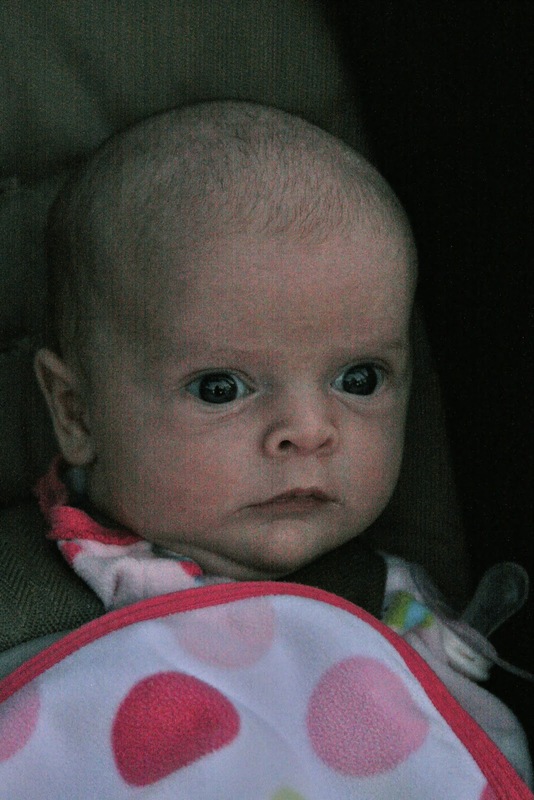 I was going to dress Amelia in the pea-in-a-pod costume that Nick wore when he was a month old, but it went down into the 50s while we were trick-or-treating, and I was worried she'd be too cold. 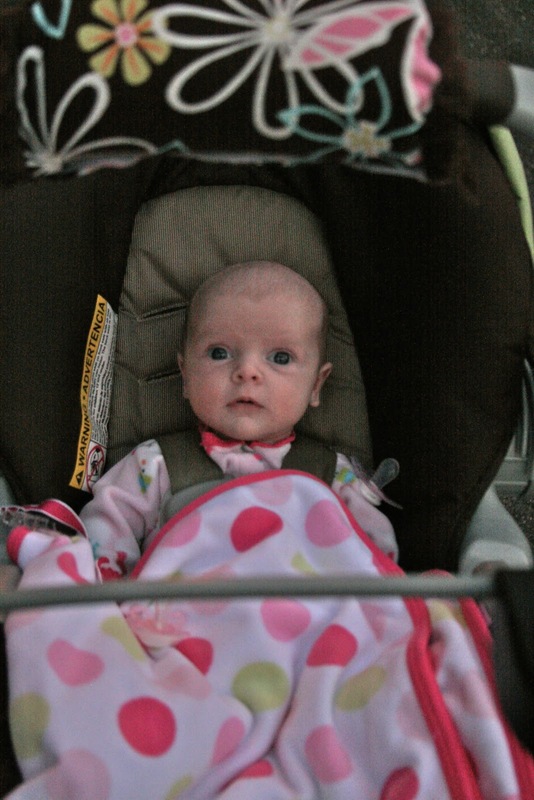 So she just hung out in the stroller and watched everyone else. As we have in years past, we drove to an adjacent neighborhood to trick-or-treat. They basically close the streets down and party all night long. All the houses are decorated to the nth degree. We stayed out for about an hour and 15 minutes, which surprisingly was plenty for the boys. They just didn't want to miss the famous Shave Ice House, where the homeowners rent a shave ice truck every year and give those out as treats. So once we hit that one, they were ready to turn around and head home. It was right around the Shave Ice House that we ran into a blog reader -- which brings me to the second point in my post title: "YOU." For whatever reason, there are between 650 and 2,000 of you who visit this little blog on any given day. At certain times, like when I was in the hospital, many of you came by multiple times a day to see if there was an update. I rarely get to meet any of you in real life, simply because the vast majority of you don't live near me. The second time we were recognized, again I was not with them. I had taken the big boys to the lake last Summer and Grayson took Jake to the McWane Center downtown. Blog reader Amy W. tapped Grayson on the shoulder by the elevators and asked, "Is his name Jake?" And from there, she told him that she reads my blog and wondered what he and Jake were going to be doing that day, because she knew I was out of town with the other boys. THEN, on Monday when I volunteered in Nicholas' classroom for the Halloween party, a woman approached me and said, "I read your blog! I've read it for years!" And that was Amy T. ... whom we later ran into while trick-or-treating that night. SMALL WORLD. And also, apparently all of you people out there are named Amy. I feel almost famous; I got mentioned on Grass Stains!! It really is a small world, and there are LOTS of us Amy's out here! I was in a group in college and there were 6 Amy's out of 30 people. Love the post of boys in their costumes. Of course my favorite has to be Jake. But he is going to be cute for his age, dimples and all things Jake. Congratulations on being such a popular blogger. I feel fortunate if 5 people read my blog and one makes a comment! lol....We aren't all 'Amy'. Some of us are Rachel. Hopefully you'll make it to NC with a little spare time sometime so we can meet! Super cute kids, by the way. I had a good chuckle when I read this post. I like to post in chronological order and I have a few things to publish before I get to Halloween. My Halloween post is going to be next week! At least yours made it in the same week! Jake is the cutest little Woody! Dudettee, that is so what I noticed right away...everyone was named Amy, that was so cool. I love reading and keeping up with your family and Amelia is a sweet addition!